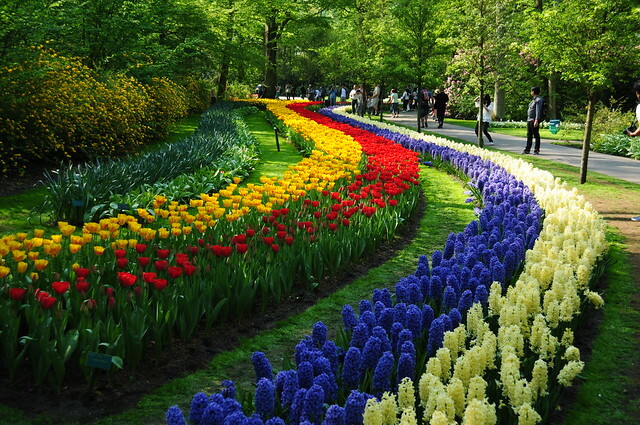 The Keukenhof Gardens in full bloom. 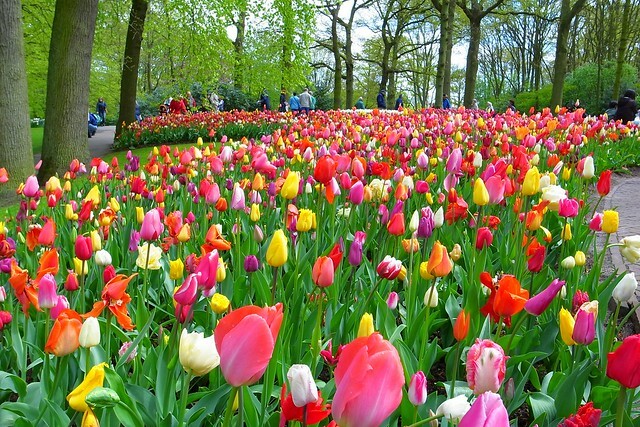 When the tulips start blooming, the best place to see them is at the world famous Keukenhof Gardens (open mid-March to mid-May). 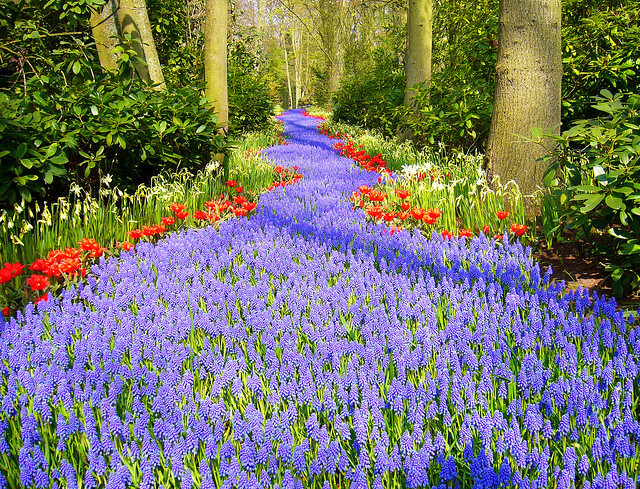 TIP: the Keukenhof Gardens are one of the biggest tourist attractions in the Netherlands so go early. If you can, go on a weekday because then you will avoid the weekend crowds. We’ve been there a few times now with friends and family who’ve come to visit us. In our experience, 2-3 hours is a good amount of time to spend at the gardens. You might spend more if you’re really crazy about flowers but most people will have seen enough after a couple of hours. By this point you’ll probably want to take a rest and get something to eat or drink. There are numerous restaurants within the gardens but they are expensive. If you’re on a budget, bring a picnic lunch and a large bottle of water. After visiting the gardens, it’s nice to spend another hour or so in the surrounding flower fields. A bicycle is ideal for this and you can rent them at the Keukenhof. They’ll give you a map of the surrounding area to follow. If you still have energy and time after visiting the fields, you may want to stop at the Museum de Zwarte Tulp in Lisse, to learn about the history of the tulip trade. Where to find it: Stationsweg 166A, 2161 AM Lisse. A direct bus is the easiest way to get to the Keukenhof. They run regularly from Schiphol Airport and Leiden. You can purchase an all-in-one ticket that includes your bus ticket and entrance to the gardens. The Keukenhof website has full details of bus routes and numbers. Going by car is also possible. There’s ample parking (€6) but if you decide to see the surrounding fields by car be aware that the roads are small and can be quite crowded. It can be difficult to find a place to pull over and park if you want to take a picture. India Gate Supermarket: Fresh paneer, spices and samosas!